I am seeking information on and a proper appraiser for an Important 1771 Chippendale Carved Mahogany Tall-Case Clock, by David Rittenhouse. Once appraised, I will be offering the clock for sale. Any help appreciated. 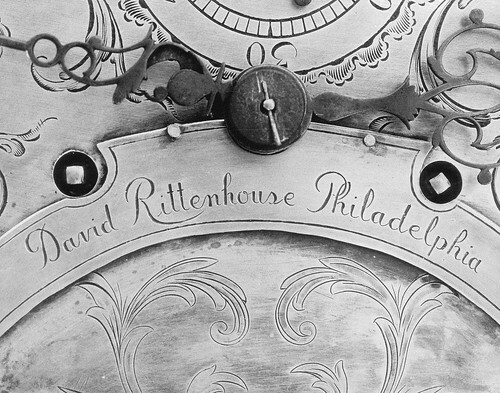 David Rittenhouse (1732-1796) was eighteenth-century Pennsylvania's most accomplished clock- and instrument-maker. An avid astronomer, he built complicated astronomical clocks and orreries, or planetary models, that not only kept time but predicted celestial events. These major works, coupled with his notable and widely publicized observations of Venus passing between Earth and the Sun in 1769, established him as a scientific leader and secured him an eminent place in the history of American science. This eight-day clock in a plain walnut case, made about 1770, reminds us, though, that Rittenhouse spent more than twenty years—from about 1750 until the Revolution—making clocks for a living. Largely self-taught, he incorporated standard English features in this timekeeper: the movement has cast brass plates and steel pinions; a seconds pendulum; an anchor escapement; a rack-and-snail striking mechanism; a second hand on the escape wheel arbor; and a calendar. The dial is engraved "David Rittenhouse/Philadelphia." The lead weights, according to oral tradition, survived the Revolution while most others did not. Probably because they sympathized with the British, the family that owned the clock hid the weights in a well to avoid having them melted down for shot. Ironically, Rittenhouse was one of those responsible for the Pennsylvania Committee of Safety's drive to procure ammunition during the war. His duties included collecting the lead clock weights commonly in use and replacing them with iron ones. David Rittenhouse (1732-1796), the maker of Drexel University's Astronomical Musical Clock, was Philadelphia's most noted astronomer, mathematician, scientific instrument maker and surveyor during the 18 th century. His clock dates to c. 1773 and has been regarded as the most important clock in America. The uppermost dial is an orrery that gives the positions of the then-known planets: Venus, Earth, Mars, Jupiter, Saturn and Mercury. The lunarium in the center dial shows the phase of the moon at the particular time that appears on the clock. Chippendale thirty-hour walnut tall case clock DAVID RITTENHOUSE (1732-1796), EAST NORRITON TOWNSHIP OR PHILADELPHIA, circa 1765 The hood with stepped cornice and turned corner columnettes enclosing a square glazed door opening to a brass face with applied cast ornaments at spandrels, roman and Arabic numerals, and inscribed, “David Rittenhouse,” above a thumb molded arched door, plain plinth, and molded base. My client's clock is similar to the Smithsonian ~ Behring Center clock. The case of the Drexel clock is far more elaborate. Subject clock has been owned by my client for more than 50 years. He passed away earlier this year and is now part of his estate. I am working with the executor. I want to have it appraised and then find it a good home, through a private sale or auction. I feel there are numismatist who would appreciate and enjoy owning this important clock. It would be nice to keep it in our numismatic realm. The clock is in North Ga and hasn't been on public view since he loaned it briefly to Atlanta's High Museum in 1977. I need to find a qualified appraiser and thought you or some of your readers may know of an appraiser. Some years ago--perhaps 20--one came up for sale, and I tried via Ed Rochette to get a groundswell movement to have the ANA buy it. I think the price was in the tens of thousands, but not huge. I volunteered to contribute, but it met with no interest. I'll check in with our horologist, Michael Poisson, who keeps our 9 tall case clocks and assorted mantel clocks in running order. He'll know who is best to appraise this sort of thing. Being a happily married man, I've always steered clear of horology! But seriously, we do own a tall case clock that was made by one of my wife's ancestors, William Upjohn of Exeter. I have never gotten involved in that collecting area, though, so I don't know any clock dealers or people with expertise/competence as appraisers in that field. It would be cool indeed to have a Rittenhouse clock marking time in anyone's numismatic library--hopefully a subscriber to The E-Sylum will provide it a good home! From my clockmaking days, I do know a number of clockmakers and watchmakers from the Virginia area. The only one I think that would be qualified to appraise the clock would be Donnie Sobel. He owns the Clock Shop of Vienna (VA), is the best clockmaker I know, and the most qualified person I personally know to appraise it. Also, I am a life member of the American Watchmakers-Clockmakers Institute and I can query them. There are a few nationally known clockmakers that I don’t personally know but their reputation is well-known. GIVE YOURSELF THE GIFT OF A GOOD NIGHT’S REST! Tuck a copy of Beth Deisher’s best-selling new Cash In Your Coins: Selling the Rare Coins You’ve Inherited into your safe-deposit box, and rest assured they’ll be guided by her expert advice when the time comes. 288 pages, full color, $9.95. Order online at Whitman.com (or call 800-546-2995).